Featured Stations – lets you listen to selected Internet Radio Stations selected by the Imeem community and which also depends on your own listening habit. Right now, the featured stations on my Imeem app includes Spotlight, Top 100, Urb’s Next 100 and Songs from Apple Ads. Selecting each of these music station categories will bring you to your iPhone’s iPod player and featured songs included on the respective list will start streaming. Favorites – Imeem is also a music recommendation app. The more you tell about your music preferences, the better will be Imeem’s song recommendations to you. MyMusic – This is the best feature of Imeem Mobile that makes it stand out from the rest of the iPhone music-streaming app. It lets you upload up to 100 songs to the Imeem server, which you can later on stream to your iPhone. But definitely, 100 songs are not all you that you want to stream on your iPhone via Imeem, right? If you need to store more, you can opt to get a paid account for around $ 29. This will entitle you to upload as much s 20, 000 songs to Imeem which you can stream anytime on your iPhone. That’s digital music cloud storage for you folks. Other features of Imeem Mobile include the ability to create your own favorite Artists radio, as well as a direct link to the iTunes Music Store, in case you want to purchase some more music titles. 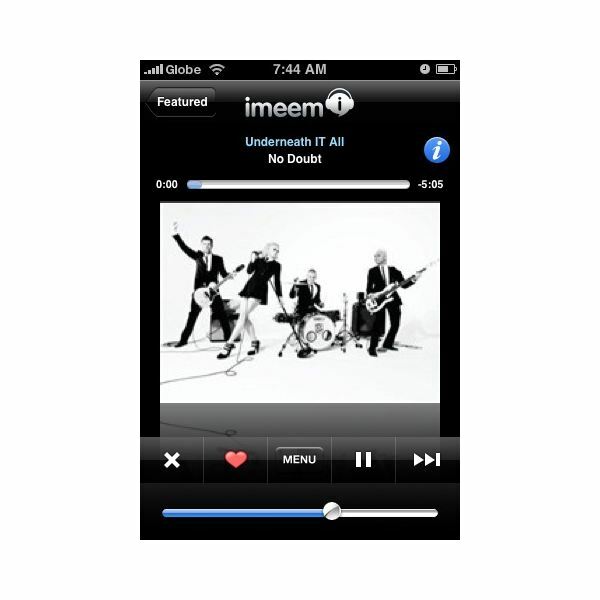 As Imeem is an Internet music streaming service, you might think that the audio quality of music is below par. Well, actually the sound quality when listening music is like listening to music via your iPhone’s iPod app. The sound quality is definitely good if not great. In fact, even if you listen through your iPhone’s built-in speaker, the sound quality is still good. Again, another great music app has arrived on the iPhone. Imeem is a great music app for you iPhone and we could not recommend not installing it on your iPhone. If you think your iPhone is running out of storage space, Imeem is your best alternative to storing your music on your iPhone. Is Imeem without a flaw? Certainly not. It has some minor setbacks particularly the lack of detailed artist tour information and listening data from social networks. I personally enjoyed using Imeem than the other music iPhone app. It’s a great combo of nice features and great audio quality. For long-time iMeem fans that have been waiting for Imeem to arrive on the iPhone, there you have it – the free Imeem Mobile app waiting for you at the iTunes Apps Store. Screenshot of Imeem Mobile by Imeem.